For the use of scientific techniques and hypotheses to attempt to support or justify belief in racism, see Scientific racism. Racialism is the belief that the human species is naturally divided into races, that are ostensibly distinct biological categories. Most dictionaries define the term racialism as synonymous with racism. In 1903, W. E. B. 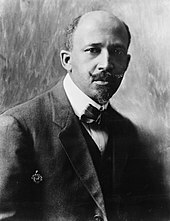 Du Bois said that racialism is the philosophical position that races existed, and that collective differences existed among such categories, the races. He further stated that racism required advancing the argument that one race is superior to other races of human beings. In In My Father’s House (1992), Kwame Anthony Appiah summarized Du Bois's philosophical stance that racialism is value-neutral term and that racism is a value-charged term. According to Oxford Dictionaries Online, racialism is "another term for racism". The Merriam-Webster Dictionary defines racialism as "a theory that race determines human traits and capacities" and defines "racism" as "a belief that race is the primary determinant of human traits and capacities and that racial differences produce an inherent superiority of a particular race". "We need to anticipate the various potential social and ethical problems entailed in population descriptors. Scientists have a social responsibility to convey their research findings outside of their communities as accurately as possible, and to consider how the public may perceive and respond to the descriptors that appear in research papers and media articles." In Racial Culture: A Critique (2005), Richard T. Ford claimed that although "there is no necessary correspondence between the ascribed identity of race and one's culture or personal sense of self" and "group difference is not intrinsic to members of social groups but rather contingent o[n] the social practices of group identification", the social practices of identity politics may coerce individuals into the "compulsory" enactment of "prewritten racial scripts". ^ Kuzawa and Sweet (2009). "Epigenetics and the embodiment of race: Developmental origins of US racial disparities in cardiovascular health". American Journal of Human Biology. 21 (1): 2–15. doi:10.1002/ajhb.20822. PMID 18925573. We conclude that environmentally responsive phenotypic plasticity, in combination with the better-studied acute and chronic effects of social-environmental exposures, provides a more parsimonious explanation than genetics for the persistence of CVD disparities between members of socially imposed racial categories. ^ "Genetic variation, classification and 'race'". Nature. Retrieved November 18, 2014. Ancestry, then, is a more subtle and complex description of an individual's genetic makeup than is race. This is in part a consequence of the continual mixing and migration of human populations throughout history. Because of this complex and interwoven history, many loci must be examined to derive even an approximate portrayal of individual ancestry. ^ Fine, MJ; Ibrahim, SA; Thomas, SB (2005). "The Role of Race and Genetics in Health Disparities Research". Am J Public Health. 95 (12): 2125–8. doi:10.2105/AJPH.2005.076588. PMC 1449495. PMID 16257933. Genes appear to have no role in existing first-generation health disparities research, which typically relies on self-reported race (defined according to US Census Bureau categories) as collected in retrospective or prospective cohort studies or from administrative databases. Second-generation health disparities research has identified numerous patient, provider, health care system, and environmental factors that are independent of human biology as contributors to health disparities among racial minorities. ^ Michael White. "Why Your Race Isn't Genetic". Pacific Standard. Retrieved December 13, 2014. [O]ngoing contacts, plus the fact that we were a small, genetically homogeneous species to begin with, has resulted in relatively close genetic relationships, despite our worldwide presence. The DNA differences between humans increase with geographical distance, but boundaries between populations are, as geneticists Kenneth Weiss and Jeffrey Long put it, "multilayered, porous, ephemeral, and difficult to identify." Pure, geographically separated ancestral populations are an abstraction: "There is no reason to think that there ever were isolated, homogeneous parental populations at any time in our human past." ^ "The Genetic Ancestry of African Americans, Latinos, and European Americans across the United States" (PDF). The American Journal of Human Genetics. Retrieved December 22, 2014. The relationship between self-reported identity and genetic African ancestry, as well as the low numbers of self-reported African Americans with minor levels of African ancestry, provide insight into the complexity of genetic and social consequences of racial categorization, assortative mating, and the impact of notions of "race" on patterns of mating and self-identity in the US. Our results provide empirical support that, over recent centuries, many individuals with partial African and Native American ancestry have "passed" into the white community, with multiple lines of evidence establishing African and Native American ancestry in self-reported European Americans. ^ Carl Zimmer. "White? Black? A Murky Distinction Grows Still Murkier". The New York Times. Retrieved December 24, 2014. On average, the scientists found, people who identified as African-American had genes that were only 73.2 percent African. European genes accounted for 24 percent of their DNA, while .8 percent came from Native Americans. Latinos, on the other hand, had genes that were on average 65.1 percent European, 18 percent Native American, and 6.2 percent African. The researchers found that European-Americans had genomes that were on average 98.6 percent European, .19 percent African, and .18 Native American. These broad estimates masked wide variation among individuals. ^ "Oxford Dictionaries Online". Oxford Dictionaries. Oxford University Press. Retrieved 20 February 2016. ^ racialism. Merriam-Webster. 2005-01-01. ISBN 978-0756957766. Retrieved 6 February 2016. ^ Takezawa, Yasuko; Kato, Kazuto; Oota, Hiroki; Caulfield, Timothy; Fujimoto, Akihiro; Honda, Shunwa; Kamatani, Naoyuki; Kawamura, Shoji; Kawashima, Kohei; Kimura, Ryosuke; Matsumae, Hiromi; Saito, Ayako; Savage, Patrick E; Seguchi, Noriko; Shimizu, Keiko; Terao, Satoshi; Yamaguchi-Kabata, Yumi; Yasukouchi, Akira; Yoneda, Minoru; Tokunaga, Katsushi (23 April 2014). "Human genetic research, race, ethnicity and the labeling of populations: recommendations based on an interdisciplinary workshop in Japan". BMC Medical Ethics. 15 (1). doi:10.1186/1472-6939-15-33. Retrieved 24 February 2019. ^ Ford, Richard T. (2005). Racial Culture : A Critique. Princeton University Press. pp. 117–118, 125–128. ISBN 0691119600. Kwame Anthony Appiah (1993). In My Father's House: Africa in the Philosophy of Culture. ISBN 978-0195068528. Agustín Fuentes (April 9, 2012). "Race Is Real, But Not in the Way Many People Think: Busting the myth of biological race". Psychology Today. "Thomas Sowell discussing "Racial Quotas" with William F. Buckley, Jr. on Firing Line (1981)". Retrieved October 13, 2014. "Race". Stanford Encyclopedia of Philosophy.